"Microsoft's COO Kevin Turner announced at WPC'11 that the company hopes to sell up to 100 million Windows Phone devices a year. Targeting and catering for a larger user base is the first baby step in achieving this goal." Going from the current sales figure of Windows Phone devices to 100 million a year are pretty lofty goals. 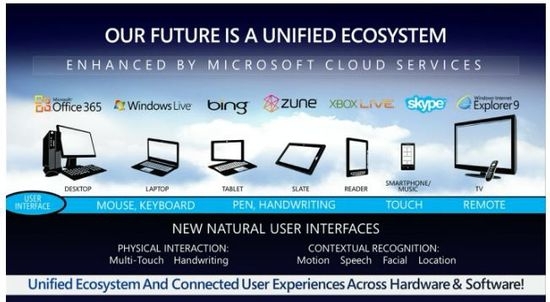 But that's exactly what Microsoft's COO Kevin Turner announced at WPC'11 as the company's goal for the future. Kevin explained Microsoft intends to attain these goals by taking the Metro UI and going after a unified "3 screens" strategy. Microsoft will use the Metro UI and bring it across PCs, mobile devices and TVs to tie them together in a unified ecosystem. f he is talking about the time when W8 will be available for Desktop PCs, PC Tablets, Media Tablets and Smartphones it might be an achievable goal; it will not happen with WP7 though. The "deal" with Nokia does not mean that everybody who uses the Finland devices will automatically switch to MS OS based ones, no way. Unless of course Nokia will be able to offer the same functionalities its actual devices have to the new ones powered by MS which I do not think will be allowed. It is a good idea. If Microsoft could provide free or very affordable cloud services, it maybe a winner. I don't think Microsoft is expecting anyone to switch straight away, most people are in a contract at the moment anyway. Although it looks as though WP7 has a higher customer satisfaction rate than Android now so this is good news for both Microsoft and WP7. Nokia also still does have very strong brand loyalty in many parts of Asia. And many people there will buy it just because it's Nokia. Elsewhere, especially in N. America, Nokia will have to reprove itself. But I do think that people are willing to give it a chance.